With temperatures across the U.S. dipping into the single digits and lower this week, every pet owner should make sure they are doing what they can to keep their dogs and cats safe from cold weather pet hazards. While some dogs enjoy the snow, none of them should be outside for too long, particularly if they are susceptible to the problems caused by winter weather. Which Pets are At Risk? When temperatures drop below freezing, most dogs and cats will quickly get chilled when outside, particularly if wind is causing the temperatures to seem even lower. There are a few breeds of dog that enjoy cold weather (such as Akita, Malamute, Bernese Mountain Dog, etc.). These dogs have stout, furry feet and thick, coarse coats or double coats that will protect them from the elements for a time, although none of them should stay outside indefinitely. Some dogs and many cats, however, have finer coats or hair which is less insulating. Regardless of the amount or density of their coats, however, all dogs need shelter from the weather and protection from bone-chilling winds. Puppies and kittens, small pets, elderly pets and those with illnesses or compromised immune systems are especially susceptible to cold weather. Safe Pet Ice Melter is gentle on your pet’s paws. The cold weather can also lead to other health hazards in wintertime. People use antifreeze in their automobiles, but if dogs or cats lick up just a small amount of this toxic compound it can be fatal. Rock salt used to melt ice and snow can burn their delicate pads and become lodged between their toes, where it can cause more damage. Many people don’t think of dehydration as a potential health hazard during the wintertime, but it can become a serious problem. 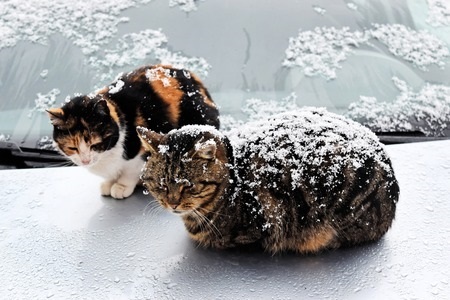 Cold air holds less moisture, so pets can develop dry, itchy skin and become dehydrated. Indoor air is also prone to dryness because of heating systems that pull moisture from the air. To keep your pet safe, comfortable and healthy during cold weather, there are several steps you can take. If your dog or cat will be outside for even brief stretches of time, make sure you provide adequate protection from the elements. It should be an enclosed, waterproof shelter with a door flap to keep out the wet and the wind. Straw can be added for insulation and a blanket or some other soft material for bedding. A dog house should have enough room for your pet to stand and turn, but not much larger. A snug house will help conserve your pet’s body heat. 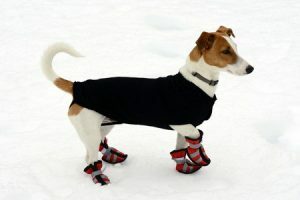 A warm coat and snow boots protects this terrier against cold and ice. There’s no way to fully protect your dog from winter weather since dogs must go outside periodically to relieve themselves. Before taking your dog or cat outside for a walk, put a coat or sweater on them for insulation and protection. If it is snowing or wet, a waterproof coat is preferable. To prevent contact with rock salt or caustic ice melt products, cover your pets’ feet properly. Pet booties that are made of rubber or other waterproof materials fit over their feet and fasten around their ankles. If your pet resists wearing them, you can also protect their pads by applying a waterproof salve or petroleum jelly in a thick layer that can be wiped away when your pet comes inside. Pets should always have fresh food and water; this is particularly true in the winter, when dogs and cats may burn more calories to stay warm. Fresh food and water inside is easy to provide, but you should change their water frequently and offer more of it during the winter. If your pets will have to be outside for even a short period of time, invest in a heated pet bowl so that their water won’t freeze and be undrinkable. If the air in your home is dry, also consider investing in a good humidifier that will increase the moisture content in the air. Don’t bathe your dogs or cats as often during cold weather so that their coats will retain their natural oils and their skin will retain natural moisture and be less prone to itching and flaking. If you need to melt snow and ice off your sidewalks and driveway, be sure to use products that don’t use caustic or hazardous ingredients. 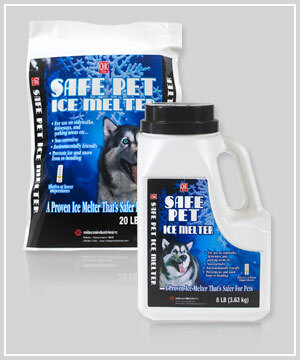 There are safe and effective ice melt products that won’t irritate sensitive skin or foot pads. If you use antifreeze, make sure you securely close the container and store it out of the reach of your pets and children. If any of it spills, mop it up completely. It only takes a small amount to poison your dog or cat. Cold weather pet hazards can be prevented with a few simple changes in your pets’ routines and proper preparation by you. By protecting them from cold weather pet hazards, you can ensure that your furry friends are happy and healthy throughout the season.